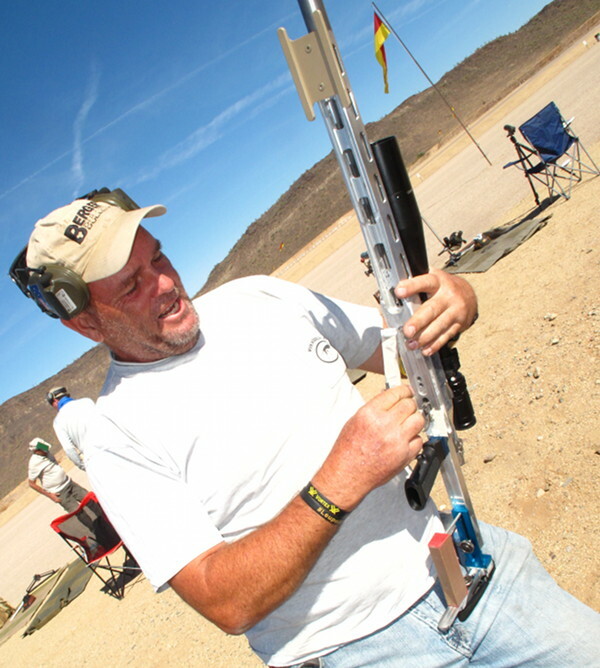 Reigning NRA National Long-Range Champion John Whidden in action on the 1000-yard line. 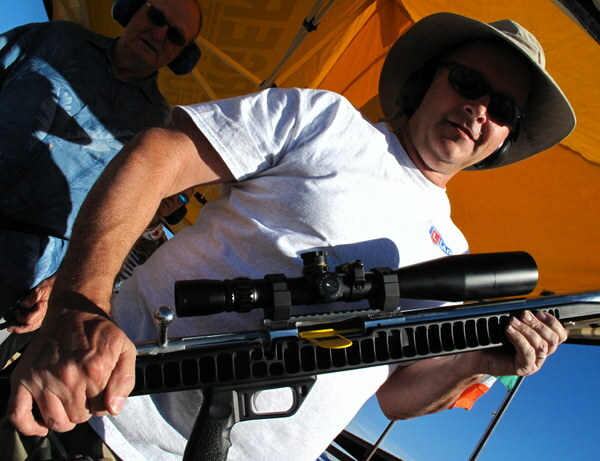 John’s rifle features a centerfire action in an aluminum Anschutz small-bore stock. There are now two more days left for the 2018 Berger SW Nationals, with the competition heating up. From this point on, all shooting will be at 1000 yards. Friday was challenging, with increasing wind velocities over the day. Shifts were harder to figure out, and some talented shooters dropped 8-10 points. Competition was fierce. In the sling division, our friend Gary Eliseo of Competition Machine came out on top via tie-breaker. Gary and Stuart Mackey shot identical scores on Friday at each distance: 150-8X, 150-7X, and 149-8X, both finishing with 449-23X. That’s as close as it gets. Today, Saturday 2/10/18, all shooting will be at 1000 yards, with both Individual and 4-person Team competition. 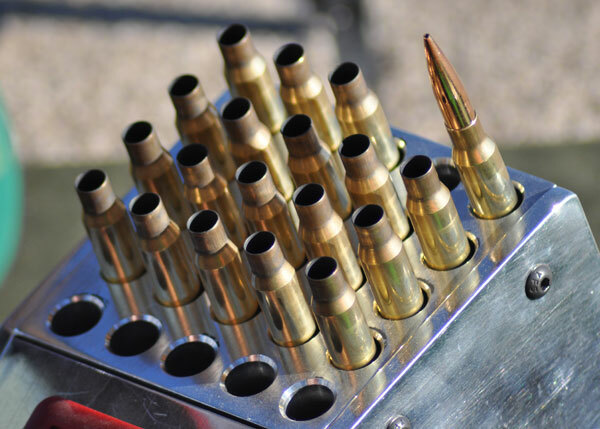 The format calls for two, 20-shot matches for both individuals and teams. Good luck to all! 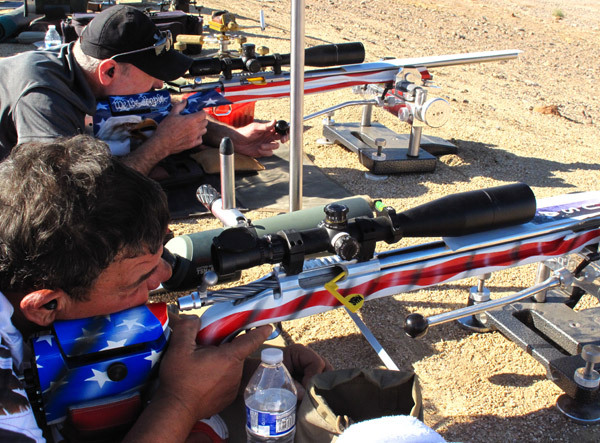 There were two very patriotic F-Open rifles side-by-side on the firing line yesterday. These Stars and Stripes rigs were squadded right next to each other just by chance — but it made for a great show. 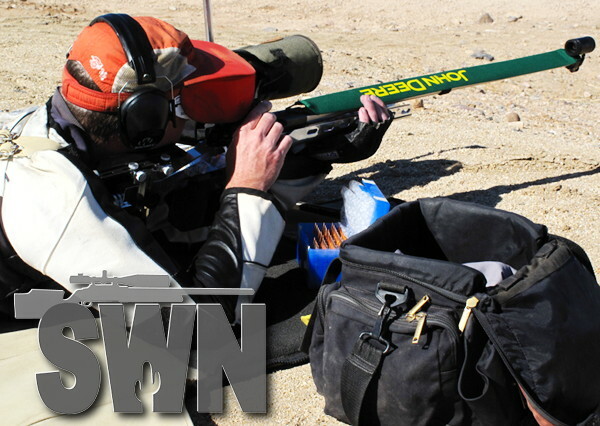 Erik Cortina, member of Team Lapua/Brux/Borden, is one of the nation’s top F-Class shooters. But on Friday he was only the second-best Cortina at 1000 yards. 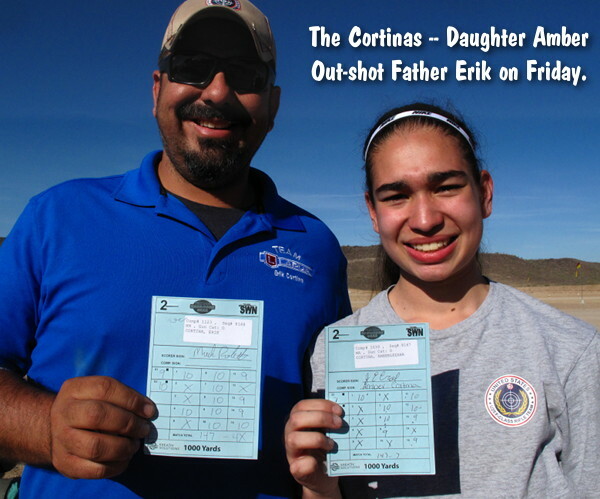 Erik’s daughter, Amberleeana, posted a 147-7X to edge her Dad by 3 Xs (Erik scored 147-4X) from the 1000-yard line. F-Class is not just a man’s game. 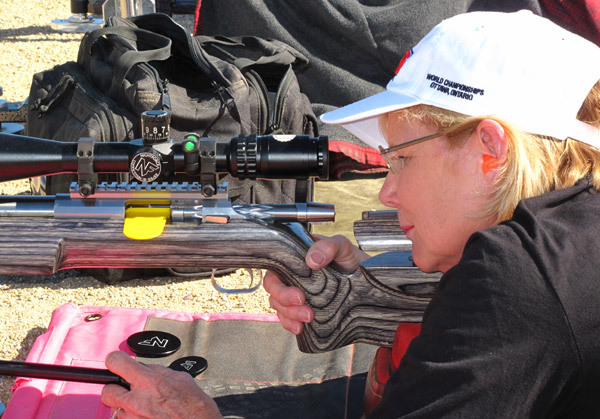 There were many lady shooters on the firing line, in both F-Open and F-TR Divisions. 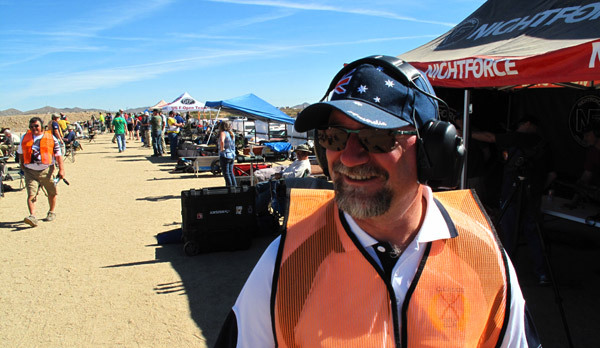 Some shooting instructors says females learn faster than their male counterparts, so they can excel quickly in the shooting sports. 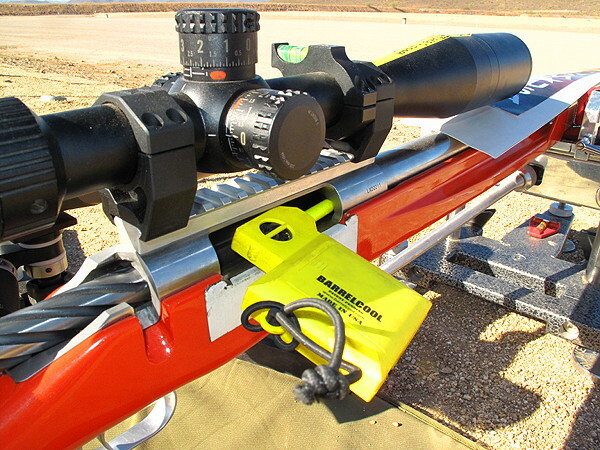 The clever BarrelCool is a dual-purpose device that serves as an Empty Chamber Indicator (ECI) while cooling your barrel with a battery-powered fan. This is American ingenuity at its best. We saw many interesting F-TR rigs. Here’s an one-of-a-kind stock, machined from aluminum billet by shooter/owner Mark Roberts of Lone Star Tumblers. There are a ton of man-hours in this unique stock. If you’ve never visited the Ben Avery Facility north of Phoenix, Arizona, here is a video shot in 2016 that shows the 1000-yard range (including drone footage). The desert range at Ben Avery is something special — check out this “birds-eye view”. This video also includes an interview with Derek Rodgers, the current F-TR World Champion, King of 2 Miles, and the only man who who has earned both F-Open AND F-TR National titles. Erik Stecker of Berger Bullets visited the match Friday. Here he talks with members of Team Berger Bullets. Eric now oversees operations of Berger, as part of the Capstone Precision Group (Berger, Lapua, SK, Vihtavuori). That’s Walt Berger in the background in the red shirt. 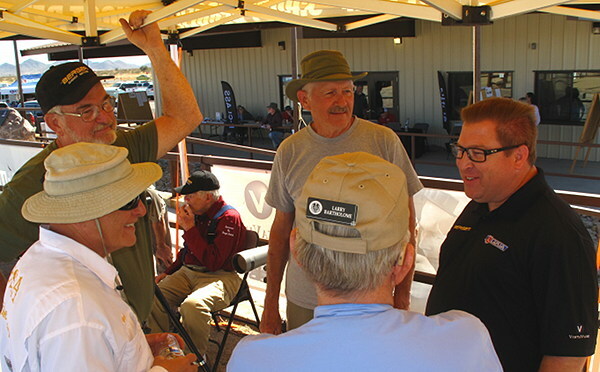 There were plenty of smiles on the firing line — the Berger SW Nationals event offers great weather, great competition, great camaraderie, and a great prize table. 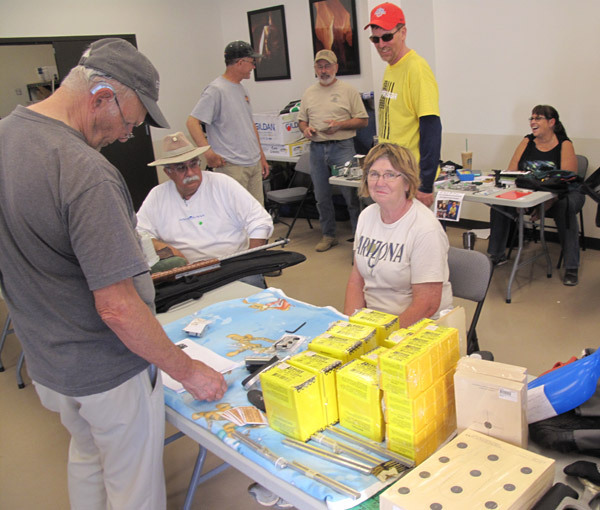 After the matches concluded on Friday, a Swap Meet was held in the Club House. There were some great bargains to be found. Can you name the past National Champions in the background of this photo? We spotted a stunning “Glamtactical” rig from Cerus Rifleworks in the Nightforce booth. Believe it or not, Cerus owner Will McCloskey found this stunning wood buried in a “bargain bin”, and snagged the highly-figured walnut blank for under $10. Steal of the year! 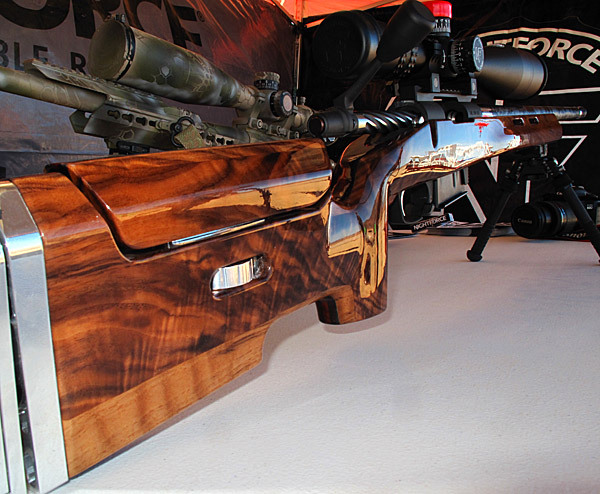 This rifle features a carbon-wrapped barrel with muzzle brake. 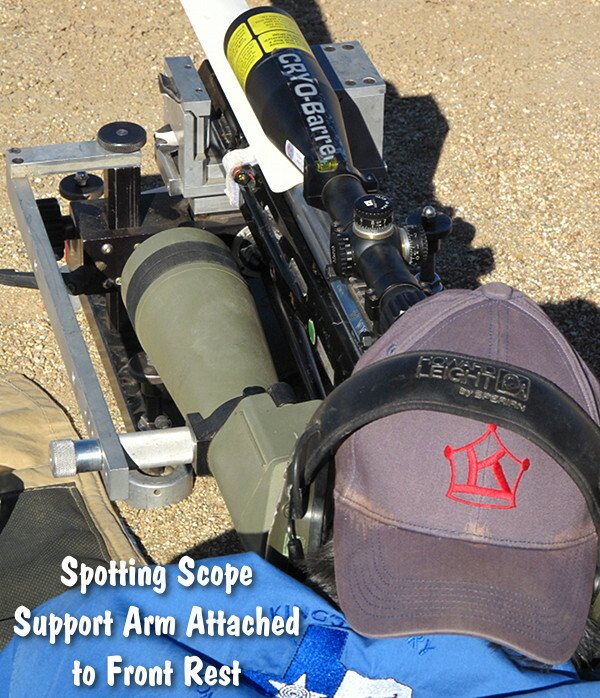 Share the post "Berger SWN 2018 — Friday Match and Gear Highlights"
I doubt that Richard King scope holder is meant to see the spotter since he can see the spotter with his rifle scope. I think it’s meant to see the mirage at a distance away from the target and focused at distance different than his riflescope. Congrats to Amberleeana and to Erik! This is one of those milestones in life that make being a father the best job in the world!